Along with an incredibly ambitious project plan for this Christmas in the NICU, fellow knitter Kathy and I unexpectedly (but happily) got our deadline moved up by a couple weeks for a local TV station, KY3-TV to come film a segment about Christmas in the NICU. We knitted and sewed like crazy women but managed to slide in under the deadline with holiday festive hats, botties, stockings/cuddlers, and snowman photo ornaments for all of the adorable December babies. My one regret from the piece is that they didn't have time to talk about all the volunteers who have knitted with me over the five years of this project so I'd like to do that now and in big script! A HUGE thank you to Kathy Grimes, a fellow respiratory therapist, who has been knitting with me for two years. She is the creator of almost all of those OMG CUTE animal hats that are so popular in our NICU plus so much more, including the hats, booties, and cuddlers from this Christmas season. Also, many many thanks to those who have knitted with me in the past as their own commitments and obligations have allowed. Please know that I always smile and think of each of you as I look through all the great hats and booties that have snuggled the noggins in our NICU in the past: Aunt Susan who created the very first October NICU "Punkin Patch" with me, my sister Suzanne, nieces Jordan and Sydney, Kisha, out-of-towners who mailed donations to our babies: Cindy, Dianne, Lisa, and fellow RT's Nicole, Yung, Shelly, Ronda, and Susan. Thank you all for your help, your love for our babies, and your dedication! There aren't really rules, per se, for knitting for the NICU but there are certain things that need to be done in specific ways. As I explain them, they'll make perfect sense. I'll go through the areas individually, but in general, keep my knitting-for-the-NICU mantra always in mind: SOFT and EASILY WASHED. Preemie babies have premature organs, including skin, which makes only the softest of soft fabrics and yarns suitable for their tender skin and all the items will be washed repeatedly in very hot water and dried in a very hot dryer to kill germs. NICU's are always in need of hats, socks, booties, hand mitts, blankets, and cocoons/cuddlers/sleep sacks. Some NICU's allow handmade toys in the cribs and some don't but even the NICU's who don't will usually gladly take hand-made teddy bears or other soft toys to give out to our babies' siblings, for Pediatric kids, or to comfort children in the ER. All babies' skin is delicate but in the NICU that is true times a hundred-fold. The younger the baby the more thin, delicate, and vulnerable their skin. With the very tiniest little Littles, there are places where their is skin is only a few cells deep, so only the softest, most gentle, non-allergenic fibers can be used. Stay away from animal fibers with the exception of alpaca, which is non-allergenic due to the absence of lanolin on the hair follicles. The best yarns for Preemies are spun from cotton, bamboo, acrylic, and alpaca. All sizes of yarn can be used; babies aren't just about baby yarn. 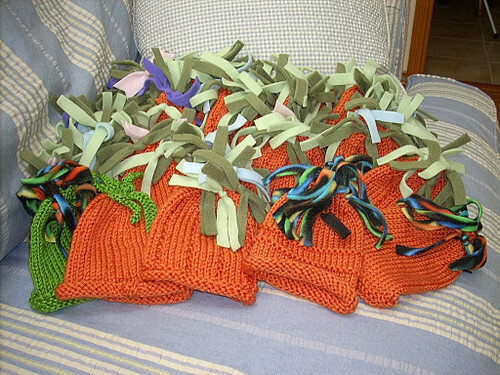 There are two purposes for hats in NICU: keeping body warmth in and keeping noise out. Premature babies are not ready for stimulation of any kind yet, whether it's light, sound, or touch. Their development has not had time to progress that far. That's why NICU's are always dark, quiet, and warm. Noise and light that seems tolerable to us can actually damage the fragile still-growing cilia in their ears and rods/cones of their eyes. 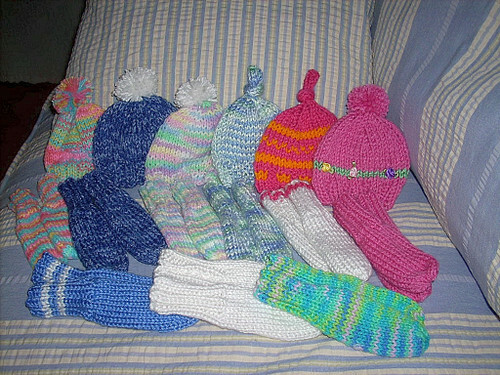 Because premature babies also lack the body fat yet to maintain their own body heat, we must supplement them with heated environment in their isolettes and with hats. Baby yarn is great, but worsted weight and bulky yarns can be appropriate and helpful too, as well as ear flaps (without any long ties that could present a choking hazard). Because premature fingers and toes are so tiny with such fragile skin and capillary beds, only tightly woven knit or crochet pattern textures should be used. As beautiful as lacy patterns are for older babies, those same hole-y creations can trap tiny fingers and toes, cutting off circulation, possibly irreversibly. To imagine the smallest of the NICU patients' fingers, look at the fingernail on your index finger. Now imagine a tiny hand, with all four fingers spanning only the width of your fingernail, and only barely or almost able to encircle your finger with their hand. That's how tiny those fingers are. Cocoons, cuddlers, and sleep sacks are very popular, and can be very useful in the NICU as long as we knitters keep in mind that they need to be created with SIDS recommendations. Keep the length to no more than 11" for 1-3lb babies, 14" for 3-5lb babies, 15" for 5-7lb babies, 17" for 7-9lb babies, and without fold down flaps around the face or hoods. This will keep any fabric from accidentally covering the baby's face. It can be found or special ordered at Michael's, Hobby Lobby, or JoAnn's Fabrics, or mail ordered directly from the publisher: Leisure Arts. There are so links in the upper left hand of the blog page. Historically, pastel colors only have been used for babies, particularly premature babies. I disagree on principle and from my own personal experience. Babies are people too and come in all sizes, personalities, and skin colors. Whether they come out to play at 23 weeks or 40 weeks they immediately have their own little personalities on display for all to admire. Some baby girls are quietly demure in a way that makes us reach for pink girly girl hats, some baby boys are already little wild men who wear deep colors perfectly. One of my favorite Christmas hats I've ever knitted was for a deeply- caramel-colored skinned girl who, I swear, SPARKLED in a bright, gem-toned purple and aqua striped Santa hat. Also, some of the most popular hats we knit in the fall are for the daddy's: camo. Camo of every hue for both boys and girls. Pastels are great in the NICU but deeper, richer colors and variegated yarns are just as wonderful. One of the great things about embellishments on hats for preemies vs toddlers, is that preemies don't chew on buttons, so within reason, as long as all embellishments are triple super duper sewed on tightly, they can be used on NICU hats. Try to keep anything sewn on to the front of the hat and away from the sides and back of the head so the baby won't be laying on any kind of applique, silk flower, etc. And the same goes for bulky seams. Try to stay away from bulky seams that the baby might lay on. Again, it goes back to their tender skin. For larger versions, click on the pics. Whew! And after all that work, know what my very favorite part is? Seeing our little Littles in those hats and then sending them home with parents as souvenirs of their time spent with us in the NICU.